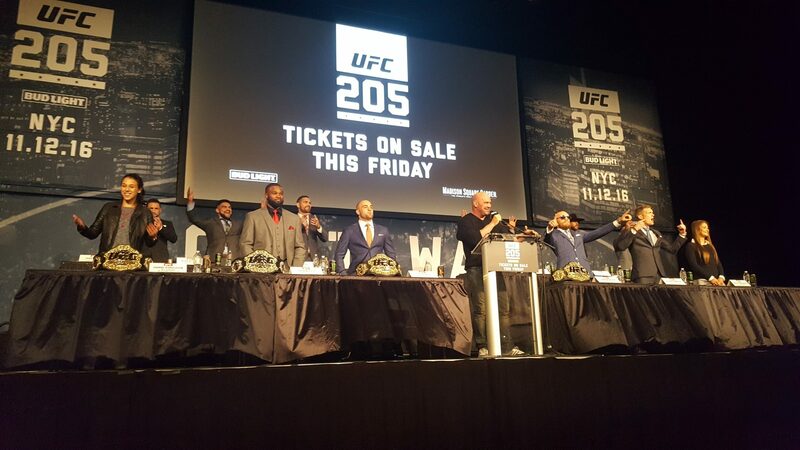 It’s finally real, it’s finally happening, It’s UFC 205 in NYC! MyMMANews is in the Theater at Madison Square Garden and we will be providing live updates to keep you abreast of the entire event. Keep hitting that refresh button because any press conference featuring Conor McGregor is bound to move at a breakneck pace! BREAKING: Dana White Announces Michael Johnson and Khabib Nurmagomedov at 205! The promo video is rolling and the crowd is going wild. Conor is the first fighter in the video, naturally. The curtains are up, and Dana, Conor, Eddie, Tyron, Stephen, Joanna, Karolina, Chris, Yoel, Frankie, Jeremy, Cowboy and Kelvin are here. Weidman says he can’t imagine not being on the 1st card at MSG. I get to ask a question, I choose to ask Conor what he thinks of the 155 move. He says he likes the 155 weight limit and is happy with the cut. He says he’s going to tear through the Lightweight division easier than he did Featherweight. Conor again “Shut your f***ing mouth, I run New York!” Yup, that’s definitely Conor McGregor up there. 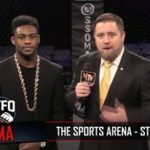 Tyron Woodley compliments NY and MSG, is summarily booed. This is a very pro-Thompson crowd. Chants of “Wonderboy! Wonderboy!” break out. Conor says his injuries from the fight against Diaz were nothing. Says he was fresh coming out of the fight, so he had no issue taking this fight 10 days ago. Eddie finally on the mic, here’s the boos… nope Conor steps in “Look at everyone up here, they’re all dressed like me, they’re trying to be me!” to cheers. Woodley says his resume “speaks for itself.” booed again. Like I said, VERY pro-Wonderboy crowd. Conor says he’s beaten Alvarez’s style of fighter “forever.” Eddie shoots back “Tell him the truth, you ain’t got a f***ing shot.” Philly attitude on point. Alvarez: “Take those stupid glasses off” Conor: “Make me.” Crowd erupts. I asked Weidman how it felt being on this card, and how he feels about none of his Serra-Longo teammates joining him for 205. His response: “I’m so proud to be a New Yorker and to be representing you all on this card.” says he wishes more of his teammates were on the card, but points out this is just the first and there are many more cards coming to NY. Thompson says he expected Lawler to beat Woodley, but since that didn’t happen, he’s ready for Woodley. Dana on what will happen if Dana wins the belt: “We’ll figure that out if it happens.” Interesting, as he has stated in the past that having a dual division champion was not going to happen. Conor says he doesn’t think about Aldo, but adds “If Frankie was good enough it’d be me and him.” Frankie looks unimpressed and unaffected by that shot. Weidman says his goal after UFC 205: “After I win this fight, I’ll win the belt.” Says after he gets the belt back, he plans to defend the belt in New York repeatedly. Conor says this will be a $40 Million year for him. The crowd loves this, but then they love everything he says. After Conor is asked who on the stage would give him the toughest fight, Jeremy Stephens weighs in, somewhat surprisingly, saying “This guy. The hardest hitting 145er there is.” Lil’ Heathen says he would knock McGregor out. Conor tuns to him and says: “Who the f**k is that guy?” sounding legitimately confused. This gets a huge laugh and cheers. If talking trash is an art form, Conor is the UFC’s Da Vinci. Conor then says after he takes the Lightweight belt from Eddie, he doesn’t know if there’s much left for him in the UFC, and that he might have to see what Floyd Mayweather is up to. Dana says it’s last question and chooses who gets to ask it. And in this last question Eddie is called out by a fan: “You say Conor doesn’t have 5 rounds in him, but in your career you’ve only been to the 5th and lost one of them!” Crowd loves it. Conor says Eddie is yet another fighter “blessed” to be fighting him. Wow, what an energetic, wild press conference! This was just what the UFC wanted to kick off the 205 festivities. The crowd brought a ton of energy and the theater at MSG was electric throughout the night. Shockingly, Conor McGregor took center stage, figuratively and literally. Once again showing that he’s got the sharpest tongue in the promotion and whoever’s in 2nd has a long, long way to go to try to match him. Thanks for joining MyMMANews.com for this Live update on the presser. More to come in my close-out video!